What to Include in a Novel Study? 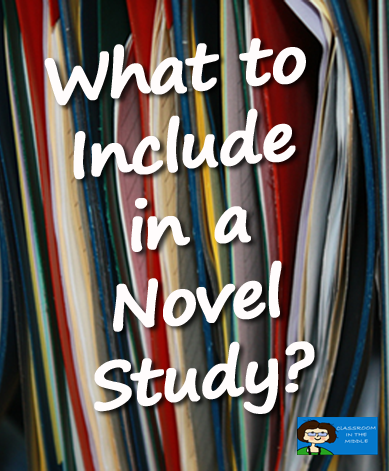 Do you have a hard time deciding what to include, or how much to include, whenever you are beginning a new novel study? These were the same choices I was thinking about as I designed the novel studies for Classroom in the Middle. Some of my favorite activities and questions are the ones that get kids thinking. That’s why I like to include open-ended questions. 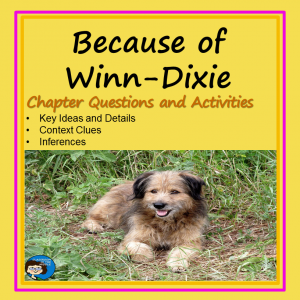 Inferential questions and questions about characters are always a good bet. I also like to always include some chances for the kids to be exposed to, and use, new vocabulary. These are the elements that I’ve used to write the chapter questions for each novel study that I’ve made so far. 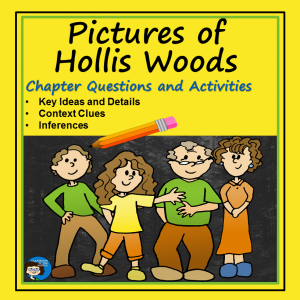 Each set of chapter questions includes a few designed to help kids understand the characters, a few of the tougher inferential questions, and a few that make use of vocabulary from the text. 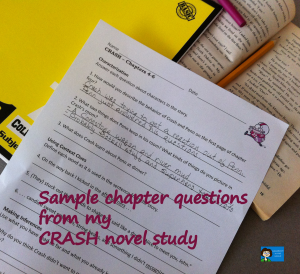 This sample is from my novel study for Jerry Spinelli’s novel, CRASH. 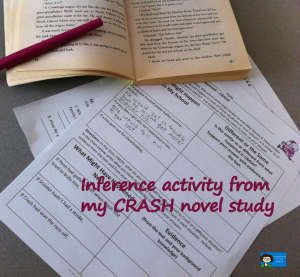 For follow-up activities to use after reading the novel, I’ve found it useful to go back to these same skills to tie it all together, so in my novel studies, I include usually two activities on characterization, two on inferences, and two on vocabulary that apply to the novel as a whole. The following example is also about CRASH. Of course, sometimes kids need to review the “facts,” the details of the novel, too. A fun activity for this is a simple game of “I Have . . .Who Has . . ?” for a quick review of characters, settings, events, etc. An “I Have . . .Who Has . . ?” game is now included with each of my novel studies. 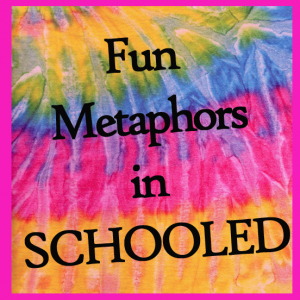 In addition to novel studies, I’ve also created some free activities specific to particular novels, such as a plot diagram activity for Number the Stars and an activity about metaphors in SCHOOLED. You’ll find these freebies in the Novel Study Section of my TPT store.